After its advent in the vaudeville scene of New York in the early parts of the 20th century, Burlesque pretty much became non-existent until Dita Von Teese revitalised it in the 21st. 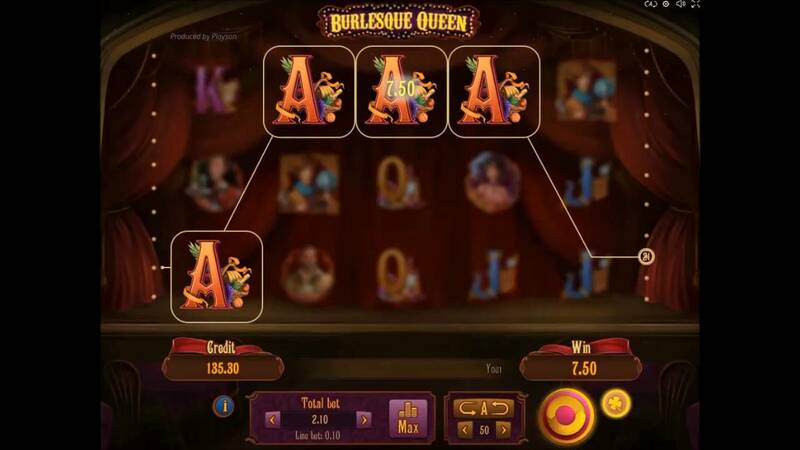 Burlesque Queen is a wonderful online slot game full of tease and desire where you’re ordered to match symbols of burlesque dancers and barman. In addition, this is also a video slots game that features cinematic cut scenes that really add to the gameplay experience. The developers at Playson, one of our favourites here on top slot games site, are extremely committed to offering players some of the best slots experiences they’ll ever encounter, by coming up with exciting themes and bringing them to life with high quality graphics and profitable features. Burlesque Queen takes you to the stage of Moulin Rouge, where the Burlesque style is taken to the highest level and the performances will take your breath away, view more! Burlesque performances have become more and more popular lately, due to the classy 40s and 50s style, extravagant dresses, hairstyles and make-up, and the beautiful performers. Feathers, shiny dresses and enormous amounts of charm are involved, along with the French spirit of seduction. A short video at the beginning of the game will introduce you to the Burlesque world and all its wonders, after which you can sit back and enjoy the authentic experience Burlesque Queen has to offer. Discover our top slot games site now! 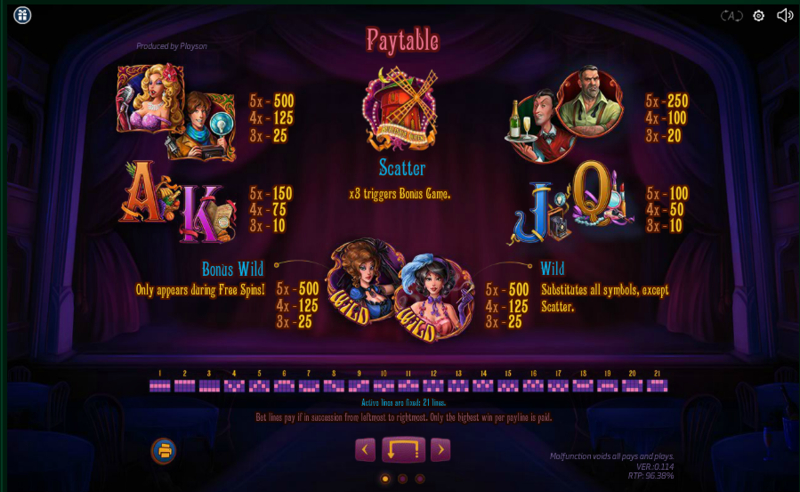 This slot game has 5 reels and 21 paylines set on the scene of a glamorous Burlesque club, where excited crowds come to admire the beautiful performers. The perfect music has been selected for a genuine experience, while the graphics are wonderfully designed, so it’s not only a profitable game, but also a visually pleasing one, as it should be, with such a theme. You can place your bets starting from 0.21 credits and going up to the maximum bet of 63.00 credits. 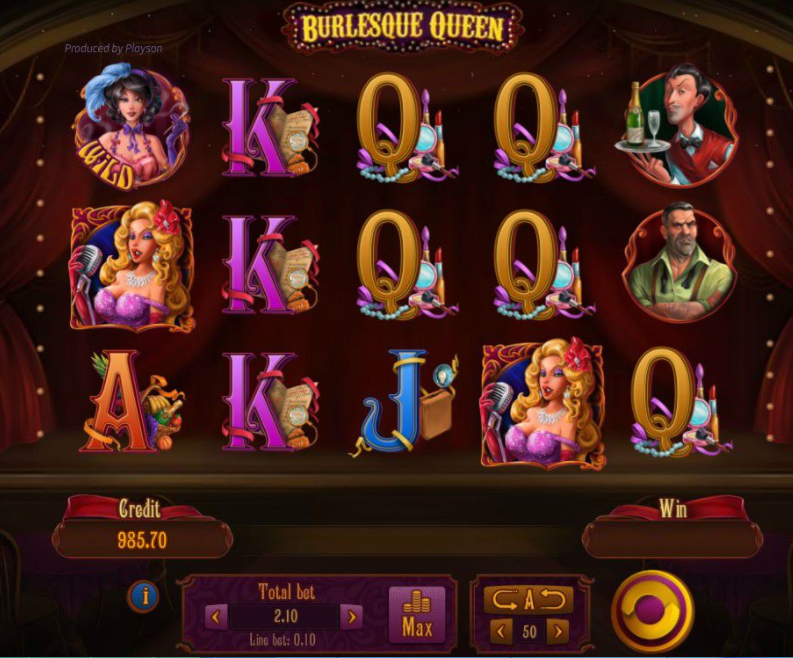 The features of Burlesque Queen will thrill any slots player. The symbols comprise different characters, from a waiter and a photographer, to the actual performers. The Wild Card is the symbol of a beautiful lady, and it substitutes any other symbols besides the Scatter, in order to form more winning combinations. We also often run various gambling promotions with this game. The Scatter is represented by the Burlesque Mill symbol, and by spinning 3 or more of them, you activate a Bonus Game that you’ll certainly enjoy. During it, you are taken to a glamorous dressing table, where several items are spread across it, such as gloves, face powder, photos and perfumes, so everything a Burlesque performer might need. All you have to do is pick the items you are most attracted to. Each one holds the possibility of a prize, which can be: extra coins, Free Spins, Multipliers or Bonus Wilds. At the end of the Bonus, the Free Spins are activated. You have a number of 6 Free Spins, plus the Free Spins you collected during the Bonus. If you happen to have collected a Bonus Wild, it now appears on the reel as a beautiful lady dressed in blue. This symbol substitutes all other symbols, bringing you more prizes. If you have collected any Multipliers, these increase your wins during Free Games by up to 4x. So, what are you waiting for? Enter the exciting world of French Burlesque for a good time and plenty of glamorous prizes. Learn how to pay by mobile casino and start spinning! 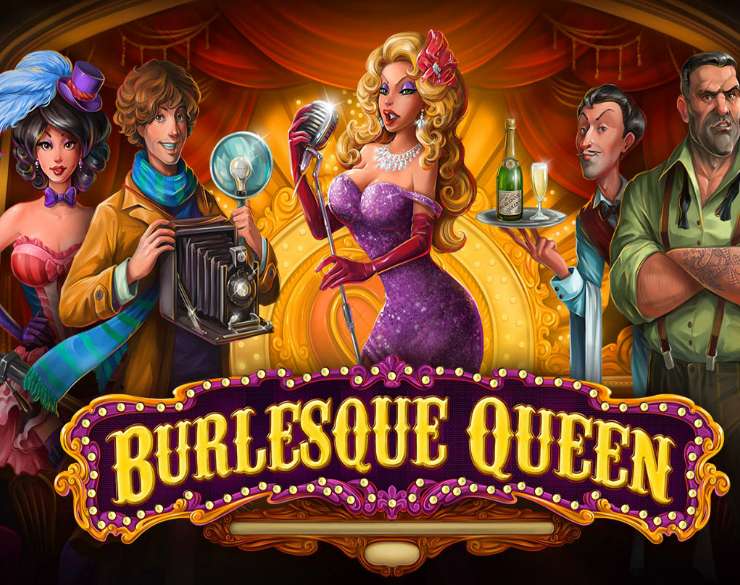 Burlesque Queen is a slot game developed with a lot of attention to detail. You will be charmed not only by the performers but also by all the thrilling features that are waiting to be tried out. You’ll certainly end up satisfied with the experience.